Is it yummy? I'll be honest, taste is my main concern. The healthy part is Mom's priority. BOL! The good news is that there are treats that make us both happy. 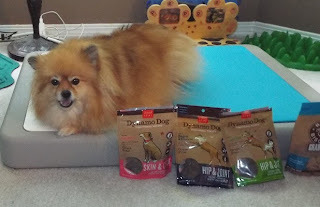 My newest treat discovery is Dynamo Dog functional treats from Cloud Star. I assume the functional part is one of those healthy things that Mom likes. By now, you all know how Mom is, we have to read the ingredients before I am allowed to taste anything. All of the bags are marked Grain Free and made in the USA. Mom is smiling, good! Now we check the ingredient list on the back of the bag. Mom recognizes all of the ingredients, so they are natural. Even the moistening agent - glycerine, is derived from vegetables. There are no artificial colors, artificial flavors, BHA/BHT, or by-products. High Paw! 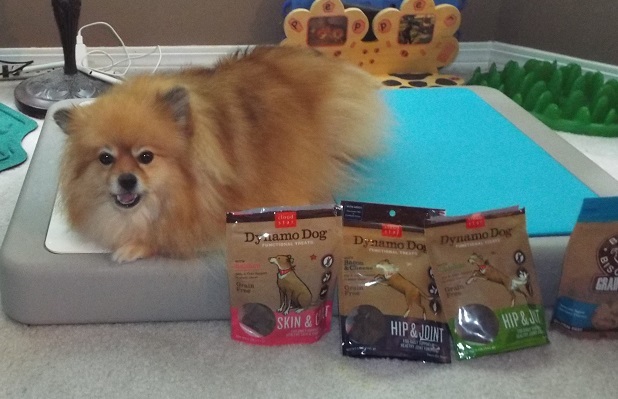 Now that the Dynamo treats have Mom's approval, let the tasting begin! The Bacon & Cheese Hip & Joint ones are delicious! The functional part of the treat is the Hip & Joint part. This means they have glucosamine, chondroitin sulfate, and other things that are good for my knees. 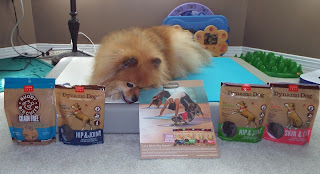 So now I know that functional treats means treats that do more than taste yummy. The Hip & Joint Dynamo treats come in chicken flavor too. Chicken, chickpea flour, potato flour, tapioca starch, maple syrup, vegetable glycerine, glucosamine hydrochloride, carrots, apples, spinach, cherries, sweet potatoes, cranberries, natural flavor, yucca, salt, salmon oil, green lipped mussel, phosphoric acid, chondroitin sulfate, parsley, ginger, sorbic acid (as preservative), vitamin C, vitamin E, chamomile, turmeric, manganese, vitamin B, citric acid, mixed tocopherols (as preservative), rosemary. These are also great for my knees and yummy! There is a chart on the back of the back that says how many treats different size dogs should eat a day. I am under 26 pounds, so I am only supposed to have half a treat per day. 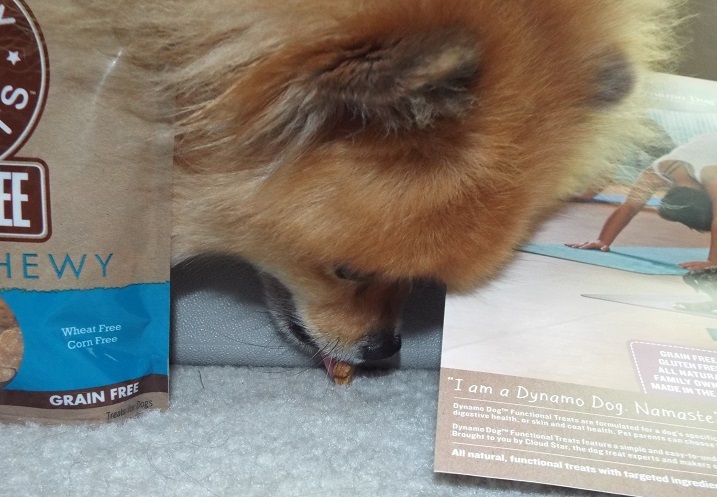 I cheated, and ate the whole treat in these photos. BOL! The Skin & Coat treats must be furrific for every dog! I know we all have skin, and most of us have fur (coat). BOL!! Flaxseed, salmon oil, vitamin E, avocado, and egg are all ingredents that are good for skin, and hair/fur. I know someone is going to ask me about the avocado. I looked it up at the Pet Poison Helpline. Avocado contains a toxin called persin, but despite the rumors, avocado is not poisonous to dogs, nor likely to cats. Only certain species are poisoned by persin. While dogs and cats don’t seem to be affected by persin, avocado poisoning can be deadly to birds and large animals (such as cattle). The bigger risk to dogs and cats is a foreign body obstruction, which can occur if the dog swallowed the whole large, round avocado seed; due to size alone, this seed can get stuck in the esophagus, stomach or intestinal tract of dogs. This bag also says I should only have half a treat. I wonder if Mom told them to put that? She keeps trying to limit my treats, so I suspect a conspiracy! BOL! I will bark back at Mom that I can have a whole treat because I am extra fluffy. That means I have as much fur as a bigger dog! BOL!! 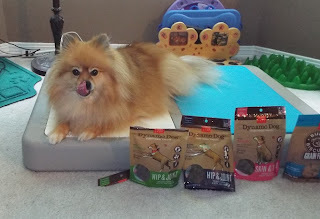 These Salmon Skin & Coat treats are lip-licking pawsome! 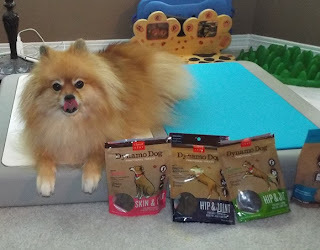 I wonder if I can convince Mom that I have enough fur for 2 treats? BOL! 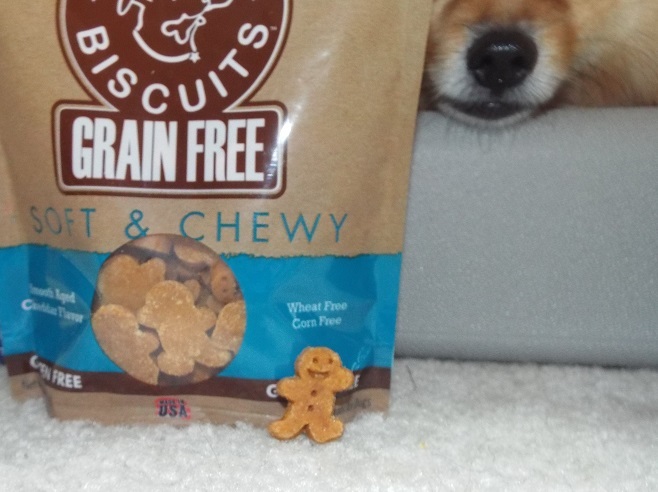 This cute little man is a Grain Free Soft & Chewy Buddy Biscuits. I have been eating the original Soft & Chewy Buddy Biscuits treats since I was in puppy school. 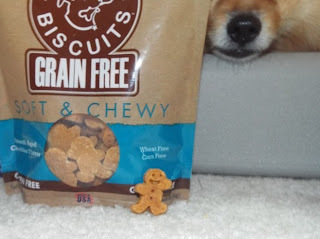 This is the first bag of grain free Buddy Biscuits that I have seen. They must be new! Yummy! Cheddar cheese is one of my favorite treats! I don't see any daily treat limits on the bag. Hand it over Mom! Those yummy cheese men are mine! Mom and I agree, Cloud Star treats are pawsome!! I love the taste, and Mom likes the ingredients. Oh Pepper, those sound delicious!! And Ma likes that they are all-natural. 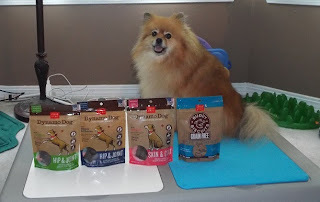 We definitely will have to give those treats a try!! Thanks for a great review! 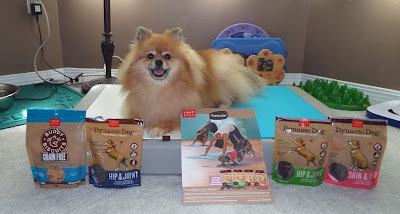 We'll be looking fur Cloud Star treats at our local treat stores fur sure! 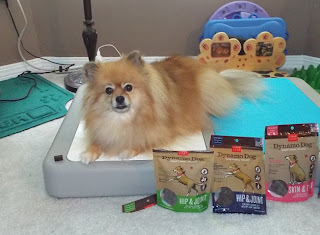 Wow Pepper excellent blog and with those ingredients mommy did not see anything I am allergic to and maybe it will help my patella. OMD!! Those sound and look yummy Pepper!!! I'll have Ma keep her eye out for them!! Ma new abouts the avocados, she gives them to me sometimes...I haven't quite made up my mind abouts them yet though! My 15.5 yr old dachshund, Squirt, loves these treats. They are nice & soft & he only has 2 teeth so they are perfect for him!